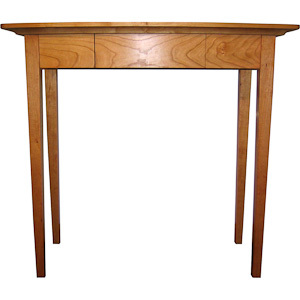 The Boothbay Sofa Table works well for dressing up the back of a sofa or as a nice hall way table as show in the picture. An optional shelf on the bottom provides a nice area for a display of dried flowers or a basket of books. An optional drawer is available to store keys, gloves or other items. Each piece is available in four standard sizes. If none of these sizes meets your needs, please contact us to make one that fits your specific needs. Mixed woods please add 15% of the higher priced wood. New!! Now available with Walnut Inlay around the perimeter of the top. Note, other sizes and wood species can be designed to meet your specific needs. Please inquire.